Gold Coast is a company based in Salt Lake City, California, that makes products best described as amazing fun on two trucks and four wheels. 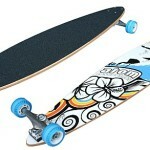 These include cruisers and longboards, which the company has been making for a number of years. 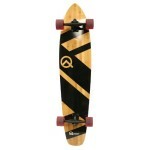 The company endeavors to create amazingly fun boards with high quality design and using great materials. Most Gold Coast longboards are made from bamboo or maple that is precision cut and cold pressed. The use of bamboo and maple results in a great board with the right amount of flex and strength. 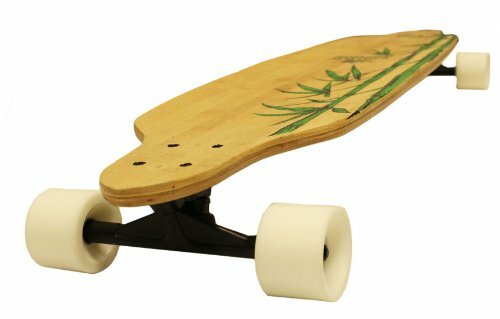 Bamboo longboards have also become increasingly popular with riders for several reasons. These include being light, flexible and fast growing, making them more eco-friendly. Maple is known for its use in making extremely high quality decks and longboards. The use of maple or a maple/bamboo combination is common to most of the best longboards in the market. From the time Gold Coast longboards first hit the market, they became popular with all types of riders. The first longboards by Gold Coast were of good quality and very affordable. With time, Gold Coast has striven to create even better boards. This has culminated in the company being one of the best longboard brands as well as creating some of the best longboards in the market. Depending one’s needs, experience and skills, assembling a custom longboard may be more desirable. This is because one is in a better position to pick and choose the components they desire and how it all comes together. Those experienced in longboard but without the skills needed to assemble a longboard can also have a custom board. 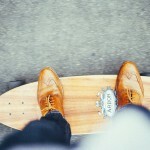 This can be achieved through websites by shops that offer custom longboards in addition to the manufactured ones. Other reasons include saving on costs, assembling the needed parts over time or as a challenge or project. When it comes to creating a custom board, the most important component is the deck. The deck is instrumental in determining the style of riding the longboard will be best for. It determines the smoothness and stability of the ride. It also determines the durability of the board and its eventual coast. This is mostly because the choice of the board is among the greatest factors in determining the selection of trucks and wheels. Together, the deck, wheels and trucks are the main determinants of a board’s best riding style, stability, ride smoothness, durability and cost. To ensure that riders interested in custom longboards are well-served, Gold Coast also makes longboard decks. The Gold Coast decks are also made primarily of maple and/or bamboo. One therefore has the choice of either going for a complete Gold Coast longboard or a Gold Coast longboard deck. Listed below are some of the top 4 best Gold Coast longboards and decks in the market. The Gold Coast The Pressure Drop Thru deck is an extremely fun deck to ride. The deck is made of 9-ply Canadian maple that measures 38 inches in length by 8 inches in width. The deck features a “W” concave that gives you incredible stability and control. The Gold Coast The Pressure Drop Thru Deck is a versatile deck. Its size and design makes it both stable and maneuverable. This makes it ideal for a beginner’s board and an awesome tool in the hands of an experienced rider. The grip tape secures a rider to the board. The stability and safety is further increased by the bridge concave, meaning it can be used as a downhill riding deck. Combined with its maneuverability, it is also ideal for freestyle riding. All in all, this is a great deck that can be leveraged for any style of riding. The Gold Coast Cuircuit Floater Deck is a great deck for a longboard meant mainly for cruising, commuting and skating. The deck is made of 7-ply Canadian maple and is 44 inches long and 10 inches wide. The pintail shaped board comes with a 24” Wheel Base without Kicktail and is meant to be mounted on 7 inch Century trucks. The deck feels solid whatever configuration one uses the deck with. It is strong and durable as well as being very responsive, which makes for a great ride. The size of the board ensures that the board is highly responsive and maneuverable with the right configuration. The classic shape of the board makes the deck stylish and aesthetically pleasing. Depending on a rider’s preference, the deck can be used for cruising, carving, commuting, freeriding or freestyle riding. This is a truly solid and great longboard deck from Gold Coast. The Gold Coast Sketchboo Nomad Longboard is an amazing longboard from Gold Coast. The deck of the Gold Coast Sketchboo Nomad Longboard is made of premium bamboo. It measures 44 inches in length and 9.5 inches in width and it has a wheelbase of 24 inches. The board features a kicktail as well as clear grip tape. The deck rests on 7 inch Century reverse pivot trucks. These connect the 70mm wheels with a durometer of 80A via ABEC 7 bearings lubricated with Teflon. The size of the board gives any type of rider enough space due to a large EFP (Effective Foot Platform). 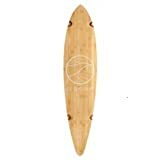 Since it is made of bamboo, the board is light and has amazing flex. A wheelbase of 24 inches increases stability while ensuring it is still maneuverable. Stability and safety of the rider is further ensured by the clear grip tape that coats the board. The trucks make for easy turning and are well-suited to carving. Combined with the wheels and the bearings, they ensure a smooth ride for the rider. A kicktail enables a rider to perform tricks. This is a great board for cruising, carving and some freeriding. The deck sits on 7-inch Century reverse pivot trucks. These connect 71mm Shred Boot wheels with a durometer of 80A via ABEC 7 bearings. The bearings have Teflon for lubrication. It has a wheelbase of 26 inches. The 7-ply maple makes the board highly responsive, strong and durable. The printed grip tape has both form and function, namely keeping a rider attached to the board and for aesthetic appeal. 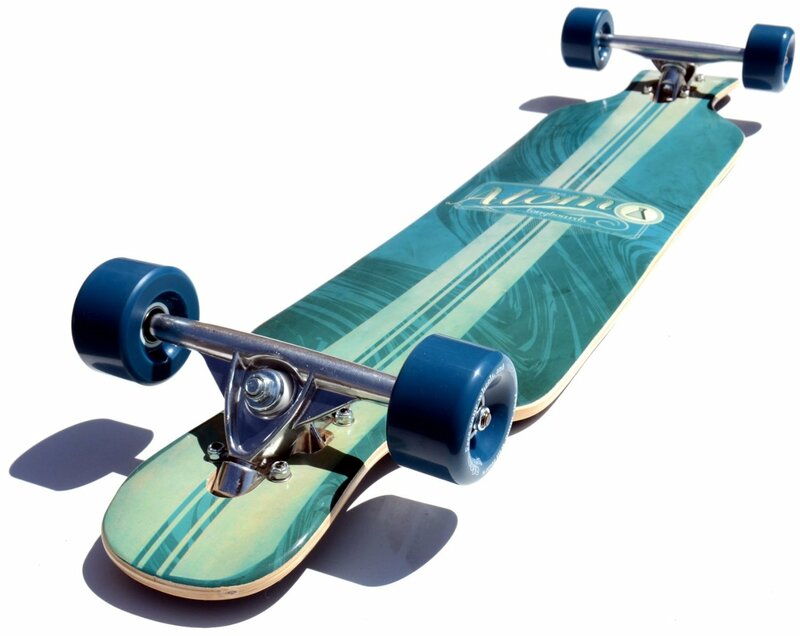 The trucks and wheels provide for a smooth and stable ride and carving. This is a great longboard for cruising and carving. It is also a great longboard for downhill riding beginners and bombing small hills. The Gold Coast Salvo Longboard is a great cruiser and a nice all-around longboard. 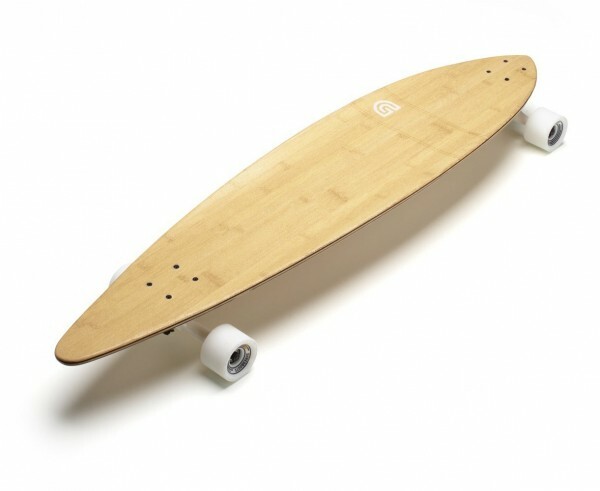 The deck is made of 5-ply Canadian maple and bamboo and measures 27 inches in length and 15 inches in width. The shovel-shaped deck has a wheelbase of 15 inches and comes with clear grip tape. The deck rests on 7 inch Century trucks. They connect the 60mm Cherry Bomb wheels with a durometer rating of 78A. The use of both maple and bamboo gives the board the right mix of strength and flex. The design and size of the board as well as its wheelbase makes the board extremely maneuverable. Clear grip tape ensures that a rider’s safety and stability is increased. The trucks work towards making the board even more maneuverable and good at carving. This is a great board for cruising, commuting, carving and some freeriding. Gold Coast has become one of the best and most renowned brands in the longboard industry. This is due to a focus on making high quality boards that are affordable, fun, high performing and are of great quality. The decks and longboards listed above are just some of the great products Gold Coast has to offer. In fact, Gold coast features in virtually all top longboard brands lists. It is also hard to find a top longboards list that does not include one or more Gold Coast longboards. By choosing Gold Coast longboards, one is assured of getting great value for their money, tons of fun, an amazing and eye catching longboard and a ride of their life.